Yemenite Tilapia - Kosher In The Kitch! Yemenite Tilapia - Kosher In The Kitch! This is the dish that convinced my husband that I could cook beyond my ashkenazic comfort zone of gefilta fish! When we spent Rosh Hashana last year with his fam, his uncle who is of Yemenite descent made this dish and it was fantastic! It is full of rich flavors like cilantro and garlic and the fish comes out very tender. This is a GREAT sauce to cook any fish in. I used Tilapia however you can use Salmon or White Fish as well. Saute the garlic. Then add cilantro. Once that has cooked together, add the red peppers/green peppers and tomatoes. Once that has cooked for a few minutes add the can of tomato sauce with a little bit of water to thin it out a bit. Once the peppers are soft, add the fish. Shouldn’t take more than 10-15 min for it to cook. I served this last night and it was amazing. Easy to prepare and delicious! So glad you liked it! My uncle made it for Rosh Hashanah and it’s now one of my favorite dishes! I just minced them. It tastes better when there are actual pieces of garlic. I made this fish last shabbos and it was gorgeous and so quick and easy. I would definately make it again. Hi – Can you please tell me how many oz a small sized can of tomato sauce is? i would probably leave out the chicken soup mix and use sea salt. chicken soup mix is loaded with chemicals. Looks great and my mouth is watering, though I just ate lunch! Does the pan need to be covered when you add the fish? Will the fish get cooked if it’s in a double layer? Hi, can you please tell me for how much fish this recipe is in either kilo or lbs. i would really like to make it with salmon. Thank you! 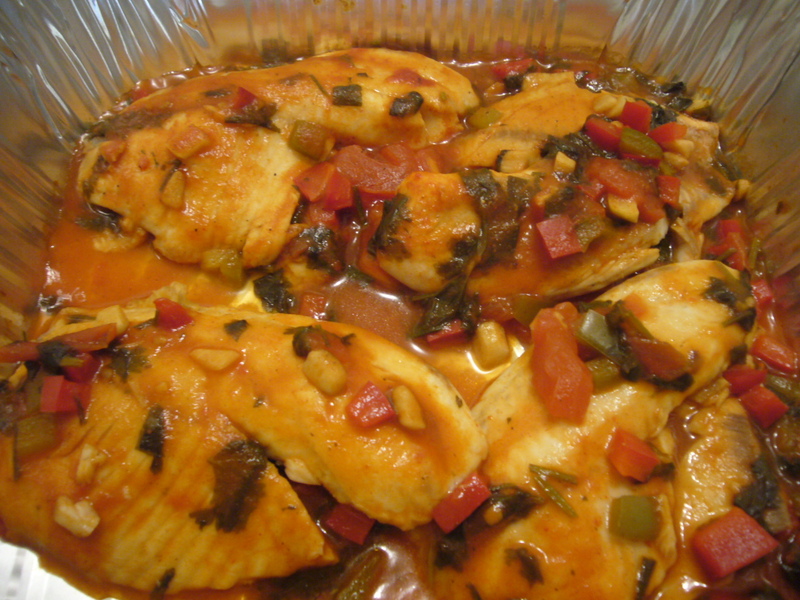 I use about 4 to 5 pieces of tilapia for this recipe and there is always lots of sauce left over.